With Brisbane slated as a great buyer’s market many property investors from elsewhere are flocking here looking for a good deal! Some investors are going it alone and some are using buyer’s agents from their home cities like Sydney or Melbourne. The question is can buyer’s agents from other cities really know the Brisbane market well enough to show you the best deal in this market? Another way to look at this is to think about whose advice you take when you go travelling? If you’re anything like me you use Trip Advisor as a guide for everything from accommodation and activities through to the best local food. Why do we use Trip Advisor? – because these reviewers are our eyes and ears on the ground! They give us immediate access to the combined benefits of local knowledge, local relationships and, most importantly recent experience. There is nothing like local knowledge to deliver a great travel experience and when you don’t have a lot of time in a place you want to make sure you make the most of it. I love travelling to New Zealand’s wilderness areas, but with a young family, I have limited time so I tap into a local wilderness guide. His intimate, local knowledge means he takes me exactly where I want to go and guarantees me the experience I’m looking for. These same rules apply to using local buyers’ agents. We live and work in Brisbane so we must know the Brisbane property market more intimately than someone who flies in once a quarter. Our local knowledge, our local relationships and our intimate understanding of Queensland buying practices mean we are guaranteed to deliver a better deal than our southern counterparts. 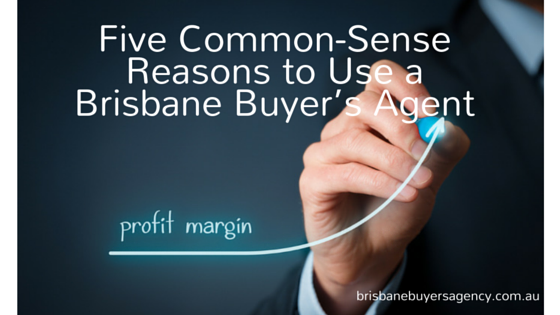 Let me explain the five reasons it’s better to use a buyer’s agent based in Brisbane. My research shows interstate buyers agents are not delivering good value to their clients. The trend is for interstate buyers’ agents to make very quick buying trips (if they are not locally represented) and so make quick decisions that can cost their clients money. Whereas local buyers’ agents, living and working locally, can jump quickly onto new listings and gauge the market by going to mid-week inspections as well as Saturday open homes. This means we know what things should be selling for, what is a good deal and what is completely overpriced. A Sydney buyer’s agent recently spent more than $40,000 above what 3 local buyers offered to secure a 2-bedroom terrace house in average condition on a busy Paddington, Brisbane road. The agent, in Brisbane on a fly-in, fly-out buying spree, made a quick purchase that cost his clients a lot of money. When asked if it was really worth it, my sales agent colleague said it was not for him to say. A Sydney Buyers Agent convinced his client to do $40,000 worth of renovations to increase rental income on an older Zillmere home. The sales agent who I know quite well advised the client not to spend any more on the home (due to the demographics of the outer suburban location) to achieve more rent. The property sat on the rental market for an extended period and is still not achieving any more than the $355 week it received before renovation. A Sydney property investor recently paid $535,000 for what I class as a knock-down site in Wavell Heights. While $535,000 might look cheap on paper for a Sydney investor this home needs extensive work to become safe and attractive enough to renters. The home has old wallpaper and differing colours in all rooms, an original kitchen and bathroom and asbestos lining in all walls and ceilings. The block adjoins large overhead power cables. It’s not an attractive rental proposition and it’s very likely the poor investor will be receiving phone calls every month asking for something to be fixed. All of these deals don’t make a lot of sense and in my opinion, I feel they could have purchased better elsewhere and also run the risk of overheating the Brisbane market. The buying strategies used by buyers’ agents from other cities do not always work here. In Sydney, auctions are widely accepted by buyers, but in Brisbane they are not (in good and bad markets Brisbane auction clearance rates will be around 30-40%) – as our rules are different. In NSW and Victoria there is a ‘cooling off’ period so you can be the highest bidder at auction but not be forced to buy. In Queensland, you have no option but to buy. Due to the generally higher cost of housing in Sydney units are still considered a ‘good investment opportunity’. The Sydney house and unit market have grown at almost the same rate. Meanwhile, in Brisbane units have experienced only 3% growth versus houses at 5.7%. The median unit price in Sydney is higher than median house price in Brisbane. The Brisbane unit market is also in major oversupply – which should be a concern for investors who have been mostly buying units here. Right now there are so many units coming online I would not consider them as an investment option. In terms of new units, developers have been offering up to $20,000 worth of incentives (in the form of furniture packages and rent subsidies) to sell the balance of units once 50% of the unit stock is sold. While this might look attractive now you need to consider the growth in value of your investment asset, the furniture has no real value. Some interstate buyers’ agents might recommend older established blocks that seem cheap, but these will eventually compete in an over-supplied rental market for modern, stylish, units with ensuite for not much more rent. Proximity to CBD is another differentiator. Compared to Sydney, some Brisbane suburbs might appear very affordable in relation to proximity to CBD, yet there are still some better-valued buys in some outlying suburbs. Our philosophy is to invest in areas that have more owner-occupiers than investors as we believe this leads to higher returns. Real estate is all about relationships and being in the right place at the right time. Being local means we naturally have more local and better connections. At Brisbane Buyers’ Agency, we manage our local relationships with sales agents very carefully – they know us and we know them. Because of my close relationships with local agents, I will hear information and, at a moment’s notice jump on a listing before it has come onto the market. To further reinforce our relationships with sales agents, at Brisbane Buyers’ Agency we’ve made a decision to outsource all property management activity. This is not the norm but we are seeing this as important to maintain our relationships with our sales agents (as many sales agents may not deal with buyers agents who do property management as they see that as a threat to their business. At Brisbane Buyers’ Agency, we can access good deals off-market using a variety of methods. Our relationships with our local agents are one thing, but we have other strategies to find great deals on-market. Things in Brisbane may look cheap and a good buy but are not – compared to the market and also the actual condition of the home. Take the example of the Wavell Heights home I mentioned earlier. That is a $535,000 headache in renovations and long-term maintenance costs for a long-distance investor. We work on a flat fee arrangement, we do not work on commission, or a rising scale of fees, so you know exactly what your costs will be up front. 2. Our Brisbane Buyers’ Agency Smart Buyers Index gives our clients the inside running on the true property hotspots in Brisbane. • how to find great deals – we recently purchased an investment property for a client for only $585,000 in one affluent inner city suburb only 1 km to the border of another suburb where the median house price was $800,000+. • how to interpret variances in the sales data to make realistic offers that vendors accept. As registered valuers and quantity surveyors, we have inspected more than thousands properties so we know what we are looking for in a property. • the neighbours – will they be neighbourly? • how the area fares in heavy rain (compared to the Brisbane City Council flood maps)? • other potential local issues that could turn what looks like a good investment on paper into a very difficult situation in real life.